Fernando Padilla, Plant Manager of Boudin Bakery in San Francisco, CA with sourdough starter that has been used there since 1849. Out of yeast? Dont worry: Its not hard to find. The feisty critters that make bread rise actually live all around us. In fact, the use of yeast in bread-making probably got its start accidentally, when wild yeast caused doughs meant for unleavened flatbreads to ferment. To this day, many bakers still use wild yeast to make bread, especially in San Francisco, a city famous for its sourdough. To make sourdough, bakers use a starter, a piece of dough in which yeast is continually reproducing with the help of regular doses of flour from the baker. The yeast that gets the starter started usually comes from the air in the kitchen or bakery where the bread is made, but some starter recipes also use store-bought yeast. Working with starters takes practice. Many variablesfor example, the amount of yeast in the air and the temperature of the roomwill affect the fermentation process. It might take a few tries before you get the flavor you like. Kids, please dont try this at home without the help of an adult. San Francisco sourdough got its start during the Gold Rush. Without access to commercial yeast, miners had to rely on the yeast present in left-over pieces of dough. 1. In a mound of flour, make a small well and add the water. 2. Slowly mix the flour and the water, bringing more flour into the center of the well. The mixture will gradually transform from a paste into a small piece of dough. 3. Knead this small piece of dough with your fingers for about 58 minutes, until it becomes springy. 4. Place the dough in a small bowl, cover it with a damp towel, and let it sit in a warm spot for 2 or 3 days. 5. When its ready, the dough will be moist, wrinkled, and crusty. If you pull off a piece of the crust, youll find tiny bubbles and smell a sweet aroma. 6. Throw away any hardened crust. Refresh the remaining piece by mixing it with twice the original amount of flour and enough water to make a firm dough. Set aside as before. 7. After 1 or 2 days the starter will have a new, fresh look. Remove any dried dough and mix with about 1 cup of flour. 8. Once again, cover the bowl with a damp cloth and leave it in a warm place for another 812 hours. 9. When the starter is ready, it will appear fully risen, and a small indentation made with a finger wont spring back. Now the starter is ready to be used in virtually any sourdough recipe. You can try it out on Berkeley sourdough. Remember to save a small piece of the starter: You can put it in the refrigerator for several days, then refresh it again as above and use it to make another loaf. A good starter will serve you for years to come! In addition to flour, water, and yeast, your starter also contains bacteria. When these bacteria feed on the sugars in flour, they produce acidic by-products. This is what gives sourdough its sour taste. Actually, all doughs contain at least some bacteria. So why arent all breads sour? 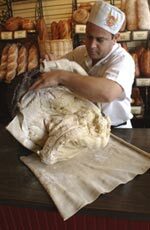 In doughs made with bakers yeast (the kind you buy in the store), the yeast outnumber the bacteria. Since both compete for the same sugars, the yeast win out, and the bacteria dont have a chance to produce their acidic by-products. In sourdough, yeast and bacteria are more closely balanced, so the bacteria have a chance to add their flavors to the bread. Sourdoughs and other raised breads also differ from one another because of the eating habits of the yeasts that make them rise. The predominant yeast in sourdough, Saccharomyces exiguus, cannot metabolize maltose, one of the sugars present in flour. Baker's yeast, on the other hand, has no trouble feeding on this sugar. Since the bacteria that give sourdough its taste need maltose to live, they do much better in the company of sourdoughs yeast because they dont have to compete for this sugar. The several strains of bacteria that give sourdough its sourness are collectively known as Lactobacillus sanfrancisco. Yeast has many homes. In fact, some strains even thrive on the surface of fruit. The following Grape sourdough starter, or biga, uses the wild yeast naturally present in grapes. The fruit also provides the sugar on which the yeast feeds.